This is another shot I captured last Fall in the Philippines. On this part of the trip, we were still doing some land-based muck diving out of Atlantis Dumaguete Resort, before boarding the Atlantis Azores live aboard for a week of exploring and diving a portion of the southeast Philippines. 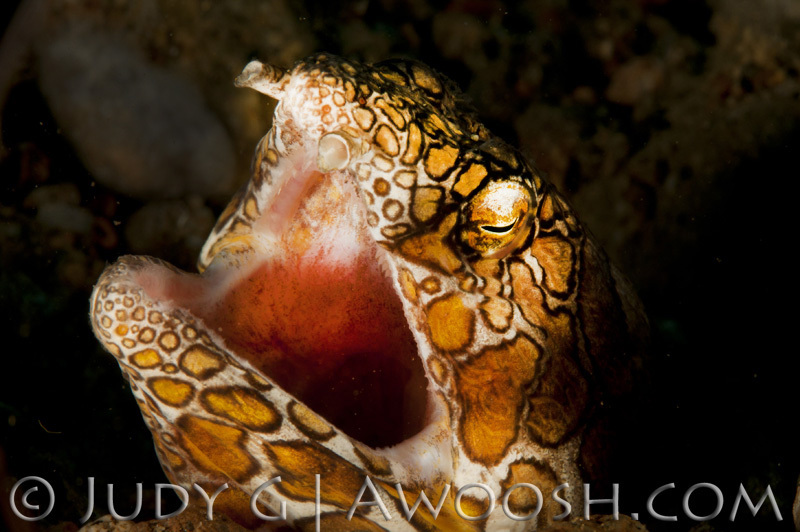 One site in particular kept coughing up some incredible stuff – blue ring octopus, poison ocellate octopus, several pairs of flamboyant cuttlefish, hairy frogfish, pipefishes, and this – a Napoleon Snake Eel, which I luckily caught mid-yawn. I actually found this thing on my own. These snake eels are ambush predators, and bury their long bodies in the silty bottom, with just their small heads poking out. At first glance, they look like a bit of rubble (the coloration and pattern really don’t pop until they are lit up), and they are usually very still (until they strike their prey), so it is easy to swim by without realizing what it is. I was pretty jazzed about this find – I’ve only seen one of these Napoleon snake eels before (in Ambon, Indonesia), and that was found by a dive guide and then shown to everyone. When that happens, our group has a gentlediver’s agreement that we will not hog the subject – typically folks take two or three shots, and then move out of the way (taking care not to silt up the shot) to let the next photographer take a whack at it. There is always an option to go to the back of the line and reshoot, but oftentimes subjects have had enough of the paparazzi by then, and have receded into the reef or taken off. However, we have all agreed that when one of us finds something interesting ourselves, we should feel free to take our time, and then try to share the find with others. So I had a couple of minutes with this eel, but unfortunately, it was quite a strong current dive, and I had beat it up current, looking for stuff, so I had no one I could share it with. By the time I had drifted back to the group to get someone’a attention, and then swam back up into the current once more, I felt confident that I would not have been able to find it again. So spotting this eel was a small miracle, mostly attributable to the lens replacement eye surgeries I had last May in which my crapped out old lenses in my eyes were swapped out for multi-focal, astigmatism correcting manufactured lenses. Even though this is common surgery these days (essentially cataract surgery), it was a pretty scary procedure for me – they actually have to cut your eye, pull the lens out, then insert another, plus in my case, rotate the lens so that the astigmatism correction was over the right part of my eye. They offer up half an Ativan as a sedative, which in my experience was not nearly enough drugs to make the procedure comfortable ;^) And as they only do one eye at a time, and I had three weeks between the surgeries, I spent most of a month not being able to read or comfortably watch tv. Looking back (ar, ar), it was all totally worth it. The trip the Philippines was my first dive trip with my new and improved eyes, and I really loved being able to spot stuff myself, even quite tiny things. Previously, I had to look through a scuba mask with thick diopters, plus my adjusted camera diopter and macro lens to see anything small clearly. I did the reverse of the normal correction, in that I had my right eye adjusted for best near vision, as I am a right eye camera girl and wanted to be able to shoot small stuff with less of a work around. This entry was posted in All About Scuba Diving, Photography, Pic of the Day and tagged Atlantis Dumaguete, Muck Diving Philippines, Napoleon Snake Eel. Bookmark the permalink.